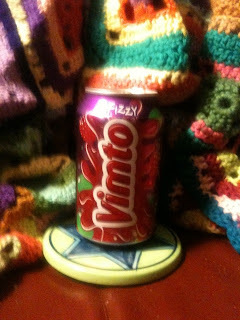 The second Weird soda I obtained from Bit O' Britain in Carlsbad is Fizzy Vimto. Here you can see it in a dignified setting, as befits a British soda. And a better view. The backdrop is a lovely afghan knitted for me by my Aunt Barbara, who would probably be happy to know that it will now be seen by...er...the throngs which view this site. Throngs, I tell you! Me: "Hey, K-i-C? You're a literature person. What's the word to use when you're trying to say that a bunch of things share a set of common characteristics that they use to convey meaning? Milieu? Weltanschaaung? Gestalt?" K-i-C: "Er. I don't think so." Me: "Argh. Do you know what I'm talking about?" K-i-C: "No. I was thinking about Euripides." Dammit. Here I am, unable to come up with the right word, and my Lab partner is off thinking about interesting things unrelated to my needs. How could she? Oh well. It seems to me that British junk food shares a certain set of common themes in its plumage, the primary element being a fairly short brand name which is simultaneously intriguing and uninformative. "Horbix", "Glutrio", and "Whangee" all seem like they could be good British junk food names*. This name is typically displayed on a brightly-colored background, in a large, balloon-ish or otherwise curved font, and conveys no information about the nature of the product. Vimto gives us a little help, at least. It bears the description "Fizzy", and there are images of fruit behind the logo, along with a liquid-looking purple splotch. Sounds like a Weird soda! Color: Reddish-purple, slightly darker than the Tango. Transparent. K-i-C: "Strangely, a bit pinkish. Well, not that strange, considering the smell." Scent: Strong, sweet, berryish. Strong element of bubble gum. Taste: Sweet, very sweet. Smooth, maybe a bit viscous. Tastes sort of like Concord grape jelly, the sort you find in tiny packets at 3 am at IHOP. K-i-C: "This is the loudest soda I've ever drunk. Did you hear how loud the bubbles are? Like Pop Rocks. " *swig* "Tastes kind of like Pop Rocks, too." The bubble gum flavor is there, along with a mild acidity. It's got a moderately mellow taste, like a fruit or berry punch, with grape being the strongest element for me. K-i-C: "Didn't you hear the bubbles. Here, hold some in your mouth." She's right. It's like Rice Krispies in there. "Mixed fruit juice drink made with the delicious secret Vimto flavour. A tantalising mix of secret herbs and spices, for the most amazing taste experience you'll ever have." A mix of secret herbs and spices? My God...it's British Kentucky Fried Chicken Soda! Okay, maybe not. It lists the ingredients as being carbonated water, sucrose, mixed fruit juices (grape, blackcurrant, and raspberry), and "Vimto Flavour". This last is further described as containing fruits, herbs, barley malt and spices. I really don't taste the barley, but I can believe it. The secrets of the Vimto Flavour are mysteries perhaps beyond the fathoming even of a Quaffmaster. It's got a reasonably pleasant fruit flavor, with a strong grape and berry tone, a big bubble gum component, and an unusually smooth texture (especially considering the strong fizziness). Not bad, but not really magnificent. Quaff rating: 3. Fairly pleasant, but ordinary. I like it sort of as I like Fanta Orange. I'd happily drink it if someone handed it to me, but probably wouldn't seek it out. Cough rating: 0.5. Strongly sweet, and I don't care for the bubble gum. * They are also good names for Great Old Ones**. In our continuing quest for worldwide Weirdness, we found ourselves in downtown Carlsbad. Now, if you are familiar with the geography of north San Diego county, you might be aware that downtown Carlsbad is about fifteen miles from Vista, where the Lab is located. Being aware of that, you might regard a fifteen mile trip as something less than impressive in terms of a "worldwide quest". You might, in fact, conclude that we were less than dedicated in this quest. If you were of a particularly rude turn of mind, you might even (heaven forfend!) scoff at our dedication to a global Weirdness perspective, and make pointed remarks as to the pluck, vim and vigor, and "can-do" attitude which seems less than evident. I can only respond to such scurrilous calumnies in two ways. Riposte the Second: the second "Dollhouse" series DVD came from Netflix, and the Lab staff REALLY wanted to watch it on the Lab theater system that night, so an actual trip to Britain was unfeasible. There. I will expect your apology by post within the week, or I shall demand satisfaction, sirrah! To be perfectly honest, our visit to Bit O' Britain was not motivated primarily by a quest for Weird soda, but rather by a hankering for sausage rolls and Caerphilly cheese for cheese muffins*. However, my job as a Quaffmaster requires me to be alert at all times for the possibility of acquiring new samples, and markets selling foreign foods are excellent opportunities to broaden the palate. 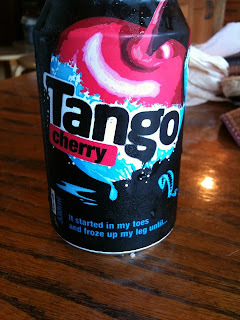 Thus, I discovered several British sodas which might be called "Weird". 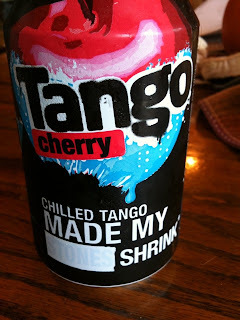 "Chilled Tango Made My ________ Shrink"
It's sort of like a redacted document, in which euphemisms for body parts are regarded as classified national security information**. In this case, the gimmick is that the missing word is printed in some sort of temperature-sensitive dye, so that it only appears when the can is cooled to a temperature suitable for soda. I believe a similar gimmick is employed on cans of Coors beer***. In this case, upon spending some time in the Lab refrigeration apparatus, the missing word was revealed to be "Stones". The can is further emblazoned with a lead-in to the gimmick phrase, "It started in my toes, and froze up my leg until...". Near this, there is (for reasons which are unclear) an image of a bear trap. The mixture of mildly raunchy phrases and vaguely threatening images on this can has left my mystified. Let's see if the soda itself is any less mystifying. Color: Transparent red, fairly light. Scent: Very much like unsolidified cherry Jell-O. Very sweet, moderately tart, synthetic cherry. Not especially promising in the eternal quest for the perfect taste of cherry Popsicles. Wyvern: "Mmmmnnneeaahhh. Not good, but not bad." Taste: Wow, much more tart than expected. The initial feel is of tart rather than sweet, with an odd burning sensation similar to Pop Rocks. It goes beyond carbonation. That tart is followed by a cherry which is very similar to the smell; very sweet and heavily synthetic. This goes beyond the innocent, artificial cherry sweetness of Popsicles, and on into some sort of cyborg-level synthetic taste. Reminds me of hot dogs, for some reason. It doesn't actually taste like meat, but there's something in the overtones of the taste which brings the juice in a pack of hot dogs to mind. Wyvern: "Tart-ish. What I think a 'tart' would taste like." I wait a while, and then try it again. The tart is still there, but the burning has faded somewhat. The cherry flavor hasn't gotten any better; it's still very unnatural, and seems to be developing more of a bitter aftertaste. Wyvern: "It doesn't make me pinch my throat closed after I sip it anymore." The cherry is slowly devolving into medicinal cherry, but with a heavy unnatural note, a weird combination of tart and bitter. Kind of vile. As fond as I am of cherry flavors, I don't care for this. And it's making my stomach hurt. I blame King George III. What the heck is in this, anyway? I am astonished to find that the second ingredient--just after carbonated water--is actual cherry juice from concentrate. I believe the British word for my state would be "gobsmacked". How can something which tastes like this actually be made of fruit juice? Another swig, and I'm still mystified. This is not a nice cherry flavor. I'm trying to not even be swayed by my love of cherry Popsicles; I wouldn't have guessed that this was flavored with cherry juice. I like real cherries. Still, in the interest of integrity, I must admit that I was wrong about the synthetic nature of this one; it is (apparently) the real thing. This had better not actually be making anything shrink. Quaff rating: 1.5. I'm really trying to like the cherry, but I can't quite manage it. Cough rating: 2.0. Not actively awful, but possessed of a certain quiet horrendousness. Update: Ten minutes later, by stomach is actually uncomfortable. Bad British! *"Hey, Jim? How do the British make their toasted cheese muffins?" "I don't know, Bob. How?" "CAERPHILLY! BWA HA HA HA HA!" **One can only wish that the redactions in United States governmental documents were hiding the same things. "The Director of the Department of Homeland Security made the decision to close the airport based on _____________" would be much more entertaining (and less disturbing) if the missing words were "bodacious ta-tas". ***Sales of Coors would probably improve if the thing which appeared when the can was cooled was not a stylized image of the Rockies, but rather something along the lines of the ideas described elsewhere in this review. Perfect. A review title which will get me arrested. I'm excited about this one. When I spotted it on the shelf at BevMo, I couldn't pass it up. Now, while I am reasonably widely-experienced in the realm of Weird soda, I am effectively completely naive about other Weird...er...substances. I drink very little alcohol, smoke no tobacco, and have had no experience with anything else. Even so, I couldn't help but think that "Mary Jane's Relaxing Soda" was meant to refer to something else. "Take a moment for yourself. Enjoy euphoric relaxation that's all natural, plain and simple. Consume Responsibly - Limit 2 bottles per day. Excessive use or use with prescription sedatives may cause drowsiness and impair ability to operate a motor vehicle or heavy equipment." I think that I need to take a good, close look at the ingredients list for this one. We've got water, cane sugar, passionflower extract, caramel color, kava extract, phosphoric acid, citric acid, and natural flavor. The Kibbitzer-in-Chief says, "Should I make some brownies for this review?" She does make some darned fine brownies, especially for someone who doesn't like chocolate. Oh, as an extra bonus, we have another guest reviewer at the Lab today. Flip-Flop Girl, a good friend, is visiting with her children. Let's see how she likes this one. K-i-C: "Yep. I guess it's a tiny bit red. Watery prune juice color." Scent: Sweet, moderately spicy. Herbal and cinnamon notes, lemony. FFG: "To me it smells like stale Pepsi." K-i-C: "It doesn't really smell like anything that special." FFG: "It smells like a soda that's been left out all day." It is similar to Pepsi, but more volatile, a bit heady. FFG: "There's something else I'm trying to identify..."
K-i-C: "It's got kind of a caramel smell to it." Taste: Stronger citrus than I was expecting, more orange than lemon. The initial taste is of citrus, followed closely by a slightly more bitter fruit. FFG: "You know how you were saying it looked kind of like prunes?" She's right...it's is a pruniness, maybe raisin-y. I think the passionflower is pretty strong. So it goes from orange-passion to prune, still not unpleasant, but definitely unusual. K-i-C: "I don't feel more relaxed." FFG: "Maybe you haven't had enough yet." Oh, isn't that ALWAYS the way these things start? There's a very, very faint hint of bitter in the later taste. If I close my eyes, it reminds me slightly of the Abbondio Chinotto, but not nearly so strong. The taste interacts nicely with the smell; the cinnamon and spice of the scent combines well with the citrus and prune. More pleasant than I would have guessed. The K-i-C and Flip-Flop Girl say the prune comes before the citrus. I guess I'm outvoted. And then the chickens (yes, the Lab has chickens) mounted an escape attempt. The ensuing chaos may have impinged on any putative relaxation effect, but it was a fairly enjoyable experience nonetheless. Quaff rating: I'm torn between 3.0 and 3.5. I'm going to go with the 3.0, based on the opinions of the K-i-C and Flip-Flop Girl. Cough rating: 1. The raisin flavor is a bit odd. This Jarritos odyssey began, arguably, with a review of Jarritos' Tamarindo flavor. It was a little while after that that I was first contacted by the Jarritos company with their offer to send me a variety pack for review, presumably because I didn't much care for the tamarind flavor. While the variety pack has held some surprises, both pleasant and not quite as pleasant, I did note that there was a tamarind bottle in it. It was as if Jarritos was offering me a chance at redemption in their eyes, a way to clear the air between us. Maybe they changed the formula! It could be their way of atoning; a humble offering for me to evaluate, to determine if their honor could be restored. Or maybe it's a chance for personal growth on my part. 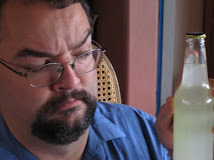 When I have expressed dissatisfaction with other Weird sodas, readers have written in with vigorously-expressed opinions concerning my comments on their favorite beverages, as well as faith that if I were slightly higher on the evolutionary scale (above, for example, yeast), I would feel differently. These occasions have reminded me that my own journey is hardly at an end, and in my voyaging I may well experience my own alterations and transformations. Perhaps I have reached a new level of maturity in which it is not the Tamarindo which has changed, it is only myself, and I will find that I now understand and appreciate it. Or, maybe, there is, in fact, no Tamarindo. Perhaps the bottle contains an assortment of vile toxins or biowarfare agents, and upon quaffing I will be reduced into a mound of gibbering protoplasm. Jarritos corporate ninjas will rappel into the Lab from their candy-colored stealth helicopters and plant a sign over my jellied remains, warning any who might see it of the dangers of implying that a Jarritos flavor tastes like "mango armpit". Color: Medium tan, semi-translucent. The color reminds me of cantaloupe, although it is a bit darker/browner. Oddly, although I don't have a comparison bottle to be sure, I think this is significantly lighter than the Jarritos Tamarindo that I had before. Is that a promising sign? Scent: Tangy, sharp, acid, not very sweet. Surprisingly, not unpleasant; there is an element of muskiness, but it's not all that bad. It's strange...almost meaty, which is kind of disturbing. K-i-C: "I don't smell anything." It *is* faint, I agree. Emergency supply of caramels? Check. Hmmm. The dominant flavor is tartness, not as sharp as lemon or quite as bitter as lime. It's got a sort of tangerine feel to it. Hard to pin down. There's a certain mango-y quality, especially to the initial taste and first follower, which is fast. It's sweeter than the smell, especially right at first. The tart comes right on the heels of that, and is followed about a second and a half later by the fruity. We go from sweet to citrusy to mango-tangerine in the first few seconds. A few seconds after that, there's the muskiness, but it's muted. Actually, it's a bit like caramel (and no, that's not because I was preemptively inoculating myself from the emergency supply). In the previous review, I likened it to pre-vomit saliva. On the third quaff, I can feel that a bit; this produces a heavy feel in the bottom of the mouth, but it's not as bad as before. K-i-C: "Tastes like sweet armpit juice." Well, I don't think it's as bad, anyway. A few more swigs later, it's becoming a bit less pleasant. The sour saliva taste is increasing, as is the muskiness. Perhaps this behaves like wine; there may be some sort of oxidation going on as it's exposed to the air, which is changing the flavor. Perhaps, as in so many cases, the K-i-C is quicker to grasp the inevitable truths than I am. I decide to take some out to the Lead Assistant Tester and .$O", who is again visiting the Lab. I'm not telling them the flavor, though. .$O": "Well, it looks disgusting." LAT: "It's all heavy and slimy in my mouth." .$O": "It's really good! Tastes like...apple cider, but fizzy." Interestingly, he's right; there is a similarity to apple cider vinegar. From this, I have learned two things. First, that Tamarindo is a complex flavor, and probably an acquired taste. Some folks seem to really relish it; others fear and loathe it. Second, there is no soda so repulsive that the LAT can't bring himself to enjoy it. He's a born Weird Soda reviewer. I am concluding that Jarritos Tamarindo isn't as bad as I thought the first time. I could enjoy the first few sips. However, as I went on, I found it less and less pleasant; the muskiness and heaviness became increasingly apparent, masking the crisp tart flavors. It went from an earthy tart sparking cider to the slightly slimy feel of cider vinegar and club soda. I could imagine, though, that someone who was already fond of tamarind would enjoy this. Unfortunately, it wasn't so awful as to justify digging into the emergency caramel stash, which saddens me. These disappointments are part of the burden a Quaffmaster must learn to bear. My thanks to Jarritos for an interesting set of samples of Weirdness to review. In the days to come, we'll be delving deeper into the realms of the Weird. I have a few samples from Mitsuwa, and...shudder...possibly another product of Biotta. *dramatic music cue* Dun dun DUUUUUUUUNNNNNN! Quaff rating: 2. There are pleasant flavors in this, but they are adulterated with Weirdness of the bad sort. Cough rating: Began around 1.5, but rose to 2.5 over subsequent sips. I'm going to give it an average score of about 2. Significantly aversive, but not a threat to one's digestion. Afterburp update: Earthy. Kind of unpleasant. Further aftertaste update: Mmmmmmm, caramels. Well, it had to happen. The Weird Soda Review now has a Facebook page. If you're on Facebook, feel free to "Like" us. It makes us here at the Lab feel special. In a fit of geekery, I tried to expand the explanations of Quaff and Cough ratings you can see on the right with the nifty "hover your mouse over something and get extra text to appear" HTML goodness. Let me know if it doesn't work for you. The Lab, like many institutes at which cutting-edge research is accomplished, can sometimes get a bit...messy. It's really not unique to the Weird Soda Review Lab; I was once a graduate student at UCLA, and I can testify that things there could also get a bit disorganized. You'd be walking the halls of a lab building, and inevitably, there would be random stuff littering the corners, stuffed in the alcoves, and (occasionally) spang in the middle of the hall. This accumulated debris of scientific inquiry ranged from broken office chairs to supercomputers which were one generation behind the leading edge. However, no matter what comprised these piles of castoffs, they were always accompanied by indicators that the piles were NOT TO BE TOUCHED. Somebody had PUT that stuff there, darnit, and they'd be sorting through it ANY DAY NOW, so you should just LEAVE IT ALONE. This was nearly universal, despite the fact that some of these piles had been there since before I became a graduate student (and my PhD took...well...let's just say longer than it should, so that things which were there before I got there were ancient indeed). In some cases, I'm not sure tat the person who had PUT IT THERE was, in fact, still EMPLOYED by UCLA, and might in fact be PUSHING UP DAISIES, and thus unlikely to HANDLE THE MESS except perhaps in a Jacob Marley-ish fashion. Professor Scrooge fell upon his knees, and clasped his hands before his face. Scrooge glanced about him on the floor, in the expectation of finding himself surrounded by some fifty or sixty generations of obsolescence and probably-useless-but-can't-quite-bring-mysef-to-throw-it-out: but he could see nothing. “I have none to give,” the Ghost replied. Well, in any case, the Lab has gotten a bit...messy. In fact, I got up early this morning, and was just about to get started on thinking about finding a pile of papers to sort into smaller piles of papers, when the Kibbitzer in Chief got up. She came out into the Lab. She looked around. She shuddered. Her eyes closed, and seemed unwilling to open. "I'm going out," she said, "for a bit." "When will you be back?" I asked, poised precariously on the precipice of springing into action on considering starting to clean up a bit. She opened her eyes for a moment, then squinched them closed, as if confronted by visions dangerous to sanity and health. "It'll be a while," she said. "Anything you want me to do while you're out?" I asked, in my usual selfless, helpful mode. She came close, and opened her eyes only when my face would fill her peripheral vision entirely, blotting out the non-Euclidean landscape of assorted junk mail. "I'm sure you can think of something," she said, while fixing me with a deeply meaningful look. Then she left. 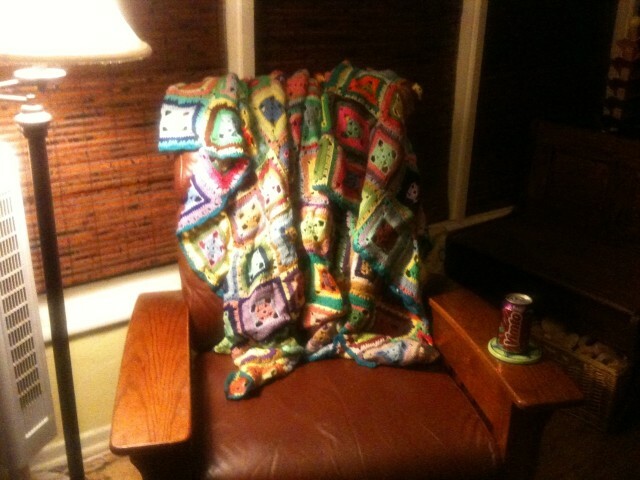 I sat, puzzled and pondering her cryptic departing message, until finally enlightenment struck. She wanted me to do a Weird Soda Review! Well, heck. It's the least I can do. Today we go with the penultimate soda from the Jarritos Variety Pack, "Toronja", which I believe to be grapefruit, based on the fruit depicted on the bottle and the English message "Naturally Flavored Grapefruit Soda" printed below. Just to be sure--we're meticulous scientists at the Lab--I looked it up in an incontrovertible source**. Apparently, it's either Portuguese or Spanish, and means "grapefruit". All right. Bring on the Toronja! Color: I would say greeny-tan, although the JAT ("Wyvern") says "yellow, with a hint of green". Slightly cloudy. Scent: Errr...not promising. To me, it smells almost exactly like lemon-scented floor cleaner. There is a sweet undertone, but the lemon is aggressive and unpleasant. Wyvern: "Lemony-ish". The use of two vague-ifiers is interesting. LAT: "Lemony lime...No! 7-Up!" There's something to that, although it lacks the crispness of 7-Up. Taste: Significantly sweeter than the smell. Strong lemonade, with little or no grapefruit bitterness. The lemon is much like the smell--acrid, and synthetic tasting. Underneath is a sticky sweetness. Pretty unpleasant. LAT: "Bluh. It sticks to my mouth. It's like 7-Up jello syrupy. Let me try that again." "Vleh. It sticks to the inside of my mouth. Gross." It's really too bad the K-i-C couldn't be here. She'd hate it. LAT: "Blech. Now it's bitter." Hmm. I don't really get the bitterness. It still tastes more like lemon floor cleaner to me. It's really not grapefruit-y at all, more of an unpleasant lemonade. It's quite strong, very sweet and strongly tart. If you had strong lemonade with too much sugar and added SweeTarts or Pixie Stix powder, it might be like this. It's not so much actively unpleasant as yecchy but not nausea-inducing. Much less pleasant than most Jarritos. Quaff rating: 1.5. Not nice to drink. Cough rating: 1.0. The "floor cleaner" aspect is unpleasant, but nothing in it makes me actively want to spit it out. Now, what to do for the rest of the day? We're approaching the end of the Jarritos Variety Pack. Soon, it'll come back down to Tamarind, the one which started it all. However, in the interest of delaying that as long as possible (I wasn't very fond of Tamarind...), we'll take on Pineapple today. Pineapple sodas are an interesting bunch. I've only reviewed one so far, and that wasn't strictly pineapple; pina colada is only pineapple-based. Fresh pineapple is a wonderful pleasure. Deliciously juicy and sweet, with just the right added tartness, it's a lovely and refreshing fruit. Pineapple soda is not necessarily so well-balanced. The Jones Pineapple Cream, for instance, is heavy on the sweet side with insufficient balance; while it's nice, it doesn't really capture pineapple. Fizzy Lizzy, on the other hand...well, I haven't reviewed it yet, so that'll have to wait. Jarritos specializes in fruit, and while they are often a bit sweet for me, pineapple's dominant flavor is very sweet. It might be a good match. Color: Mostly yellow, with the slightest tinge of yellow-green. Semi-translucent. K-i-C: "Looks like chicken broth. With celery." Scent: Interesting. Definitely sweet, but that's not all of it. A bit metallic? I don't think metallic is quite the right word. Sharp, but not acid. The image that comes to mind is a moonlit icicle. It has the same taste as the sound of an icicle breaking at night. I'm not sure exactly what that means. Being the Quaffmaster does, at times, border on the mystic. *sniff* Okay, an icicle with a bit of vanilla syrup on it. LAT: "Smells like Gatorade. Not very strong, though." JAT: "Lemony Gatorade. It smells good, though." I think it's a bit stronger than Gatorade, and definitely creamier. K-i-C: *sniff* "Is it papaya?" K-i-C: *sniff* "Smells more like papaya." Taste: Sweet, but not quite as cloying as some. It does indeed have a balancing tartness. LAT: "BLEAH." *spit* "Bubbly pineapple syrup. I don't like bubbly pineapple syrup." JAT: (enthusiatically) "Can I try?" *sip* "Wow." *pause* "I think it's kind of good." Have I mentioned that, at this point in their lives, the lead and junior assistant testers are effectively guaranteed to disagree about anything? LAT: "Can I try it again?" *sip* *grimace* "Blech." JAT: "Can I try some more?" *sip* "Surprising." K-i-C: "It's interesting. The taste is different than the smell. I feel like I need to wipe out the inside of my mouth, though. It's like pineapple with marshmallow." K-i-C: "I wonder if that means marshmallow would be good with ham?" K-i-C: "Pineapple is good with ham." LAT: "But pineapple isn't good with marshmallow!" LAT: "It's still good, though, even though...bleh." So here's the verdict. It's actually complex enough, between the taste and aftertaste, to be a reasonable approximation of sweet pineapple juice. The K-i-C is right, though...the delayed aftertaste has an oddly creamy, marshmallow-y taste. It's as if someone couldn't help but make it a pina colada. K-i-C: "Now imagine it with a slice of bacon." K-i-C: "I think my next batch of Rice Krispy Treats will have bacon bits." Quaff rating: 3.0. Best approximation of pineapple I've had yet. Would go well with bacon. Cough rating: 0.5. Still a bit too sweet. Dewy-Eyed Adorable Kid: Grampa Quaffmaster, tell us a story about the Great Review Famine of 2010! Grampa Quaffmaster: *wheeze* Well, young whippersnapper, it all started back in August of the year 2010. I was livin' back at the Lab in those days, not here in this fancy new flyin' orbital contraptio-whatzamagigger you got here. Why, back in those days, if we wanted to fly, we had to wait till someone big 'n strong came along to kick us in the seat of our britches so's we could jest soar over the crick and into the next county! And personally, I don't hold with there here trans-mat-o-rays, whaddaya-call-em's, "Telly-porters". Nawp, nawp, never have done. In my day, if'n you wanted to get torn apart at a sub-molecular level and have the quantum state of all yer bosons and fermions and whatnot edited to map to new coordinates in Schrodinger-Klein space, you had to do it yerself, with good old spit 'n gumption! We didn't have fancy machines to do it for us! You young folks today, you jest don't know what you've got. Gawd, I hate you kids. DEAK: Aww, Grampa, you're such a coot. What about the Review Famine? GQ: Oh, you want to hear about the Famine! Well, why didn't you say so? It all started back in 2010, when Obama were President. That was before the Swarm Intelligence act, when individual people were allowed to run the country. Anyway, I was jest sittin' down to quaff me some sort o' bubblin' brew for the review, when I heard this sound in the backyard. It were kind of a "vworp vworp" sound, kind o' like the oogah-horn on m'old Schwinn, and then the chickens started kickin' up a fuss, and I thought I'd better go see if it were the cyborg rebellion startin' up again. Well, it weren't. Out o' nowhere, this blue box just sort of appeared in the middle of yer gramma's vegetable patch. I was gwinter go out and let 'em have a good talkin'-to about that--probably some young kid, puttin' his blue box wherever he felt like it, no consideration. Why, back in my day, if we had a blue box we needed to materialize somewhere, we asked PERMISSION first, and you better bet we said "sir" when we asked! Gol-darned young kids just strewin' there blue boxes all over the space-time continuum, crushin' people's azaleas. GQ: Don't you interrupt me when I'm on a rant. Anyway, this youngster came rushin' out of his box, and he came up to me and said, "We need you, Quaffmaster. There's a terrible crime which is going to happen in the year 5416, and it'll crack the very foundations of reality. It will cause devastation from the founding of Skaro to the collapse of the Shadow Proclamation. All of existence is at stake." DEAK: What did you do, Grampa? GQ: I told him "First, get yer box off my wife's broccoli." Well, he went back into his box, there was that oogah sound, and the box moved over onto the driveway. He came out again, and said, "Will you come?" I asked him why it was me he needed. Back then, I hadn't ever saved the universe, not even once. DEAK: Wow. That must have been a long time ago. GQ: Yep. Well, he said three words. Just three words, and I knew I had to go. GQ: "There's a Weird Soda involved." GQ: I told him to get a haircut. Well, we went into his box, and I saved the universe, but it took a bit. So there weren't any reviews until October of that year. DEAK: Gramma said you were in the bathroom reading from August until October that year. GQ: Go clean yer room. Scent: Quite sweet, floral. Roses, tulips; a fairly mellow, heady scent. Nice. It's my understanding that Jamaica is made with hibiscus, so the floral scent makes sense. This is a bit sweeter than most hibiscus-based drinks I've had. Taste: Very sweet, but recognizably hibiscus. In my (limited) experience with Jamaica drinks, many have an earthy taste,while others add a bit or tartness. This is closer to the earthy kind, but with dominance from the sweet. Almost, but not quite, syrupy. Like many Jarritos flavors, it's probably a bit too sweet for my tastes, but still pleasant. Very clean taste, mild, uncomplicated aftertaste, without a lot of acid. I would be happy drinking this; it's a sweet hibiscus. If you imagine the Jamaica agua frescas you can get from jars on the countertop in some Mexican fast-food type restaurants, it's a little like that, but thinner and less complex. Quaff rating: 3.0. Nice enough, but unremarkable. A simple soda. Cough rating: 0.5. A bit too sweet and simple.